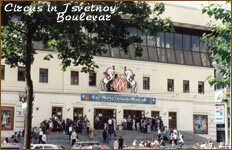 Yuriy Nikulin Circus in Tsvetnoy Boulevard was established in 1980. Yuriy Nikulin had been the Director of the Circus for many years and in 1996, on the eve of Nikulin's 75th anniversary, the Circus was named after him. 1 Day: Getting acquainted with Yuriy Nikulin Circus in Tsvetnoy Boulevard (created in 1980). Round Table: "The role of the Russian Circus in the world circus art development". The Participants - the Circus Director Maxim Nikulin - the son, Tatiana Nikulina - the wife, as well as companions of Yuriy Nikulin - the late Director of the Circus (a famous circus performer and film actor). Visits to workshops and Yuriy Nikulin's make-up room kept as it used to be. Here you can have your photos taken with Yuriy Nikulin's favorite monkey, feed animals in open-air cages. Circus performance. After the performance you can visit the restaurant "At Yuriy Nikulin's" and have your photos taken near his monument in front of the Circus. 2 Day: The visit to the Circus School. Session with the Director and the students on the subject: "The guidelines of Russian circus performers training", acquaintance with the assets, attending any classes you choose. Survey of the two rings where the students' rehearsals in different circus genres usually take place. 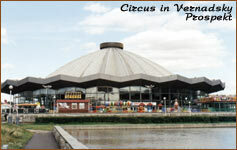 3 Day: Acquaintance with the Circus in Prospect Vernadskogo. The excursion about the circus, meetings with the management and the performers.Circus performance. 4 Day: The visit to Circus Studio of the Children Arts and Crafts Center Round table on the subject: "Different circus genres. Work with children and young adults in children arts and crafts centers". The participants - the Center Director, Art Director, actors and guests. Costume musical and circus version of Alexander Pushkin's fairy tales.Performances of the folk group "Dubravushka", the children circus company "Kalinka". The visit to the children's craftwork exhibition in the club-gallery "Krilatskiy Ornament"
5 Day: Master-class of the Russian participants and the guests in the circus studio "Kaleidoscope", meeting with the Director of the studio and young adults.